Symptoms of eye allergies, or allergic conjunctivitis, include watery, itchy, red, sore, swollen and/or stinging of the eyes. Itching of the eyes is one of the the most common symptoms of allergic conjunctivitis. Frequently one eye may be more symptomatic than the other. Seasonal allergic conjunctivitis (SAC) is the most common form of eye allergy, with grass and ragweed pollens being the most important seasonal triggers. 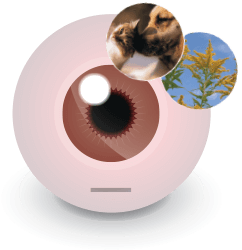 Perennial allergic conjunctivitis (PAC) is also very common, with animal dander, feathers and dust mites being the most important triggers. Fortunately, we have been highly successful in treating eye allergies with several different medical treatments depending on severity. Treatment can make a big difference just in reducing one’s pre-occupation with one’s eyes. For those considering Lasik Surgery, treatment for allergic eye condition is particularly important. Allergic eye condition can interfere with healing after Lasik Surgery and therefore should be treated prior to the surgery. Patients with more severe forms of lid allergy should consider other options. So many contact lens wearers give up on their contact lenses because allergic discomfort. Treatment with medication eye drops and/or treatment for dry eye can make a great difference in comfort. Frequently, allergic eye conditions are a result of or are aggravated by dry eye. A good tear film over the eye is important for washing away irritants and providing helpful proteins in fighting off these irritants. Call 410-768-0202 for a free consultation at Looking Glass Optical with Dr. Teles on eye allergies.